During my first year doing strength training workouts, I experienced exciting progress week after week. I lost stubborn fat, developed noticeable muscle, and moved weights I never imagined I could lift without straining. After a while, though, I grew frustrated. My strength gains kept coming, but my physique stayed pretty much the same. I kept wondering why I could deadlift one-and-a-half times my bodyweight, and yet no one walking down the street would ever guess it by looking at me. I didn’t want to be a bodybuilder, but I did want to look as strong as I felt. Many people make the mistake of thinking that lifting heavy weight is enough when trying to to gain muscle. In reality, getting ripped is a lot more nuanced than that. Turns out, there are three main culprits that could be to blame for your lack of size. According to Melinda Sothern, PhD, professor at LSU Health New Orleans, some of us have a hereditary edge over others when it comes to our ability to gain muscle. “Some people have a higher number of [type II] muscle fibers that have the propensity to become very strong, powerful, and large,” she says. While no one is born with a bodybuilder physique—that only comes as the result of dedicated training—there is a segment of the population blessed with greater potential to get big. Thanks to a higher red blood cell count and greater levels of testosterone, it’s considerably easier for men to build muscle than it is for women. “When women seek to become strong, the idea that they’re going to get these big bulky muscles like men is just not true,” Sothern says. Though some women naturally do have a high percentage of type II fibers, and thus gain muscle relatively easily, most have to make deliberate, consistent effort over a long period of time to build size and shape. I, for example, have had to train five days a week for several months to see the muscle gain I’ve experienced. And I’m not bulky by any stretch of the imagination. Third among the possible reasons why you’re not seeing size gains to match your strength is that your weight lifting routine lacks specificity. “Big muscles are not the typical outcome of typical strength training workouts,” Sothern says. Just as I wasn’t seeing muscle gain following a general weight lifting routine two to three days per week, you also may need to make some targeted changes to stimulate hypertrophy, or muscle growth (more on that in a bit). On the flip side, you could be built like a bodybuilder but still struggle to lift commensurate weight. According to Jordan Syatt, world-record powerlifter and strength coach, this is because strength is not purely based on muscle size. Yes, a bigger muscle has greater potential to be a stronger muscle, as there’s more surface area available to add mass. But pure strength—moving a heavy weight as quickly as possible with good form—also has an element of neurological efficiency to it. Basically, how efficient your brain and nervous system are at recruiting muscle fibers and telling them to contract simultaneously, Syatt explains. Can You Train for Strength and Muscle Gain at the Same Time? However, it’s important to recognize that strength training and hypertrophy training require separate approaches that you’ll have to balance in your weight lifting routine. According to Brad Schoenfeld, PhD, CSCS, you maximize strength by lifting very heavy weights in low volume, and you maximize muscle growth by lifting moderately heavy weights in high volume. So lifting for both strength and muscle gain “would involve combining some very heavy loads in the one- to five-rep range with some moderate-to-light loads, anything eight reps and above,” Schoenfeld says. There are a million ways to go about weight lifting for both strength and muscle gain. You could dedicate entire days—or even weeks—to one goal, or you could follow Syatt’s favorite approach: begin your strength training workouts with big compound movements like squats, deadlifts, or bench presses. “Go for heavier weight, lower repetitions, and really challenge yourself strength-wise,” he says. Then, as the workout goes on, switch to moderately heavy weights and higher repetitions (think 6-12 reps). Studies also show that occasionally doing low weight/high rep (15-plus) sets can also help optimize hypertrophy by targeting the smaller type I “endurance” fibers, which also have some growth potential (albeit less than type II). That’s why smart muscle building programs, like Beachbody’s Body Beast, incorporate a range of reps and sets into their design. This big, compound movement simultaneously targets your quads and glutes, according to Syatt. 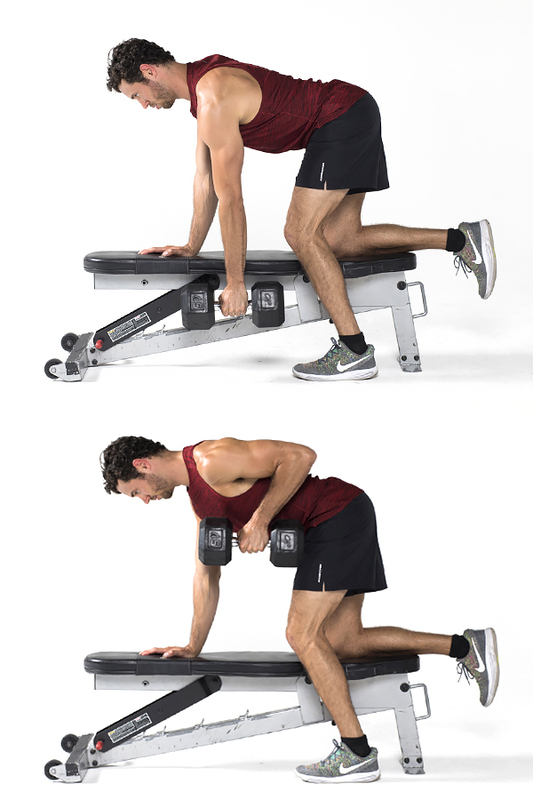 To increase time under tension—a key stimulus for muscle growth—slow your descent into the bottom position by counting off two seconds, or take a two to three second pause at the bottom before returning to the top (starting) position. 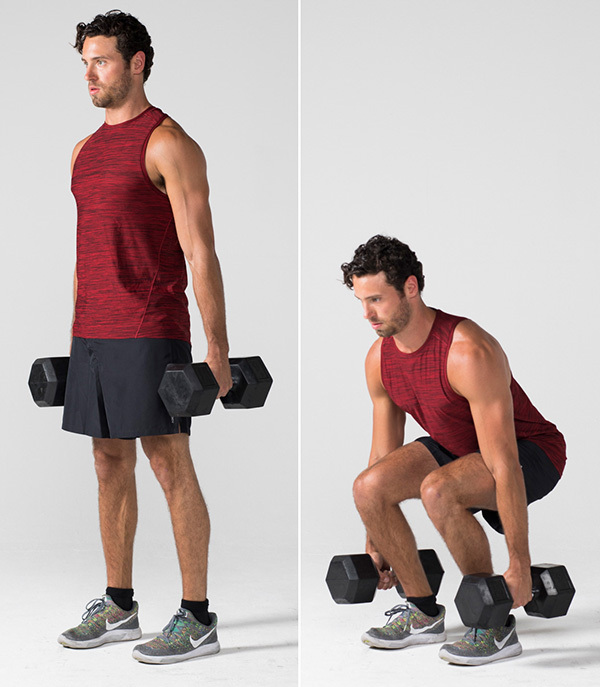 Stand with your feet hip-width apart, holding a pair of dumbbells at arm’s length by your sides. Pause, and then push through your heels to return to the starting position. 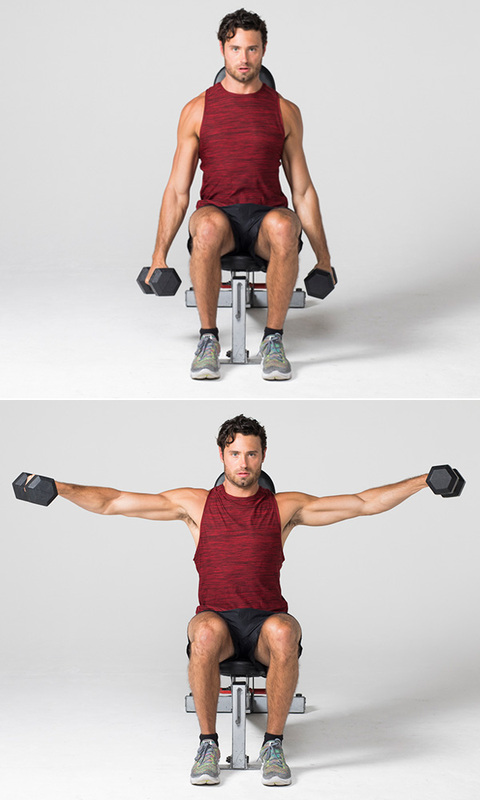 Using dumbbells will not only load your pectorals (chest muscles) like the classic barbell version of the exercise, but also enlist more stabilizer muscles throughout your torso. The more muscles you work, the more muscle you’ll grow. Like you did with the squat, slow the descent into the bottom position, or pause an extra second at the bottom before pushing the weights back up. 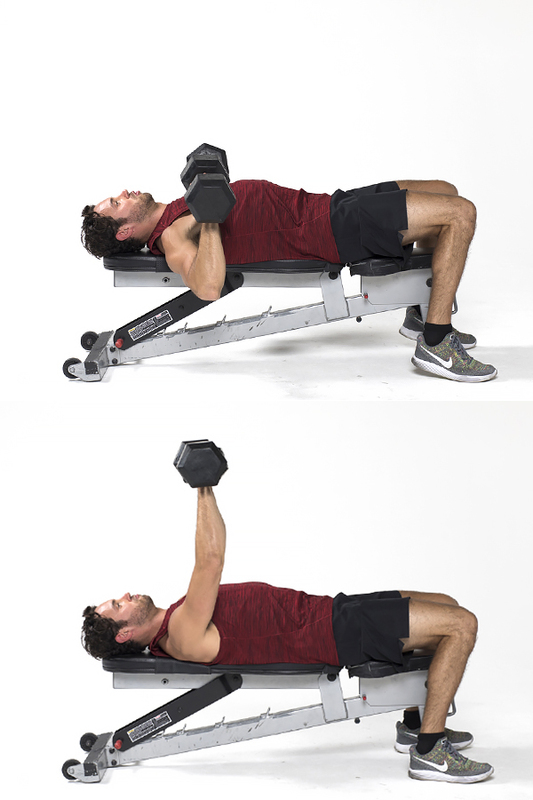 Lie on a flat bench holding a pair of dumbbells directly above your chest with your palms facing forward. Keeping your elbows close to your body and feet flat on the floor, slowly lower the weights until your elbows dip just below parallel to the floor. Pause, and then press the dumbbells straight back up to starting position. Working one arm at a time not only helps eliminate muscle imbalances, but also helps to better target your upper back muscles on each side. The result: A greater growth stimulus. This move also forces your abs to work overtime to stabilize your torso and prevent it from rotating, says Syatt. Keeping your left foot on the floor, place your right hand and knee on a bench, and hold a dumbbell at arm’s length in your left hand. Keeping your core engaged and your back flat, pull the dumbbell up toward your ribs, squeezing your shoulder blade at the top of the movement. Your elbow should remain close to the side of your body. Pause, and then lower the dumbbell back to the starting position. 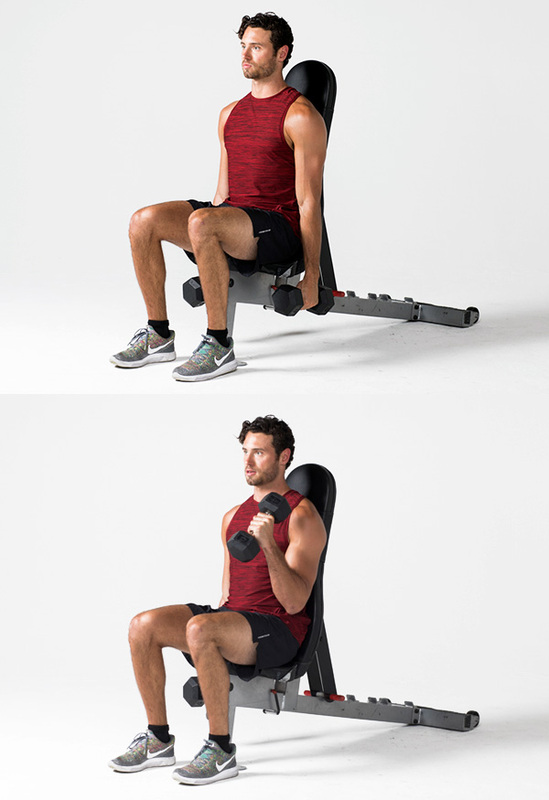 According to Syatt, doing this curl variation while seated reduces your ability to use momentum, forcing your muscles to work harder to move the weights. Sit on a bench or chair, holding a pair of dumbbells at arm’s length by your sides, palms facing inward. Keeping your elbows tucked, lift the weights as close to your shoulders as possible without moving your upper arms. Performing this move while seated allows you to better isolate your shoulders, forcing them to work harder to get the job done. The less help they get from other muscles, the more they’ll grow. Keeping your arms and back straight, your core braced, and your feet flat on the floor, raise the dumbbells out to your sides until your arms are parallel to the floor. Continue your muscle-swelling journey at Beachbody On Demand, where strength training workouts like Body Beast and The Master’s Hammer and Chisel are streaming right now!